WHAT IS CENTRAL RETINAL VEIN OCCLUSION (CRVO)? When the main retinal vein becomes blocked, it is called central retinal vein occlusion (CRVO). This is in contrast to a branch retinal vein occlusion (BRVO) where only a branch of the central retinal vein is blocked. When the vein is blocked, blood and fluid can leak out into the retina. Sometimes this can cause the macula to swell which can affect the central vision. If untreated, the swelling can get worse which can cause even further loss of vision. Occasionally central retinal vein occlusions can lead to a type of glaucoma called neovascular glaucoma. It is very important to make an appointment to be seen if you have a central retinal vein occlusion. The most common symptom of Central Retinal Vein Occlusion (CRVO) is vision loss or blurry vision in part or all of one eye. This can occur suddenly or become worse over several hours or days. Vision loss is usually painless although in some instances, pain can develop if the condition is severe enough to cause neovascular glaucoma. 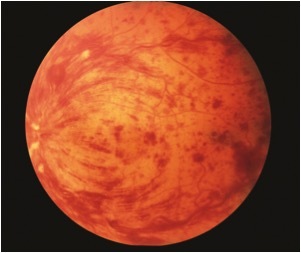 WHO IS AT RISK FOR CENTRAL RETINAL VEIN OCCLUSION (CRVO)? Diagnosis of Central Retinal Vein Occlusion (CRVO) is made by examining the eye with a dilated exam. 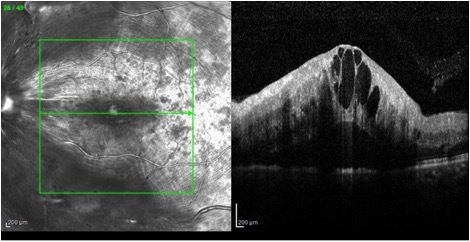 Additional testing such as fluorescein angiography (FA) and optical coherence OCT (OCT) may also be used to help determine the extent of bleeding or leakage. Like branch retinal vein occlusion (BRVO) there is no cure for central retinal vein occlusion (CRVO). The blocked vein cannot be unblocked. However, there is treatment that can recover some and even all of the vision. One of the goals of treatment is also the prevent the vision from getting worse. Treatment for central retinal vein occlusion (CRVO) usually involves a class of medications called anti-VEGF medications. Lasers and steroids may also play a role in treatment if anti-VEGF medications do not have the desired effect.